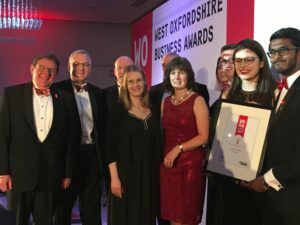 Burford enjoyed a fabulous evening at the West Oxfordshire Business Awards on Friday. Although disappointed not to win our Business & Community category, it was an honour to have been selected from so many, as one of the three finalists and to have our work with the community acknowledged. Don’t forget to contact us if our Business Breakfast, Senior Citizens Lunch, Primary Music Lessons etc are of interest to you or if you have a plan or project that might be of mutual interest.